The Swedish royal family continued to prove they are masters of the unusual tiara materials at the 2016 Nobel Prize Award Ceremony, with Crown Princess Victoria and Princess Sofia donning tiaras of cut steel. We've covered Victoria's tiara - the larger one and the more familiar piece, simply known here as the Cut Steel Tiara - in the past, but Sofia's still needs our spotlight. The Cut Steel Bandeau (the small cut steel tiara) features a lattice design beneath a row of steel studs. The piece has a pronounced curve, creating an inverted v shape on the head. The tiara is accompanied by a matching hair comb. Though steel seems an unusual material for a tiara today, it was a popular and fashionable choice for jewelry from the mid-18th century through the Victorian era and beyond. Cut steel jewelry is made of steel studs which are faceted and highly polished until they sparkle like gemstones. Skilled craftsmanship was required to turn the utilitarian material into decorative pieces; unsurprisingly, both the quality and the popularity of cut steel jewelry declined as mass manufacturing took over. These pieces are often not much to look at in photographs, but they sparkle like mad in action. If you caught any of this year's Nobel festivities live, you know what I mean. (You can check out the ceremony here, if you missed a chance to see these two cut steel tiaras come to life.) Another benefit: cut steel tiaras are extremely light in weight when compared to traditional gemstone jewelry. The Cut Steel Bandeau apparently shares an origin with the larger Cut Steel Tiara, which the royal court reports was created for Queen Hortense of Holland (1783-1837) and which most likely came to Sweden courtesy of Hortense's niece, Queen Josephine of Sweden (1807-1876). (It's thanks to these two women that the Swedish royal family has such a large collection of Napoleonic jewelry; Hortense de Beauharnais and Josephine of Leuchtenberg were the daughter and granddaughter, respectively, of Empress Joséphine, first wife of Napoleon.) Kungliga magazine reported the bandeau was another part of the cut steel jewelry collection that belonged to Hortense. The inclusion of a matching hair comb would also be typical of a set from her era. The royal court has simply referred to the bandeau as a "private tiara" made of steel, which does not say much, except to imply that the tiara is not part of the Bernadotte Foundation that houses much of the family's historical jewelry. So it seems that the bandeau has been in the Swedish royal collection for many generations. And yet it remained unseen until 2012, when Crown Princess Victoria wore the tiara to the Hereditary Grand Duke of Luxembourg's pre-wedding dinner. Victoria has worn the tiara a few times, and has used it while wearing the matching comb at the back of her head. 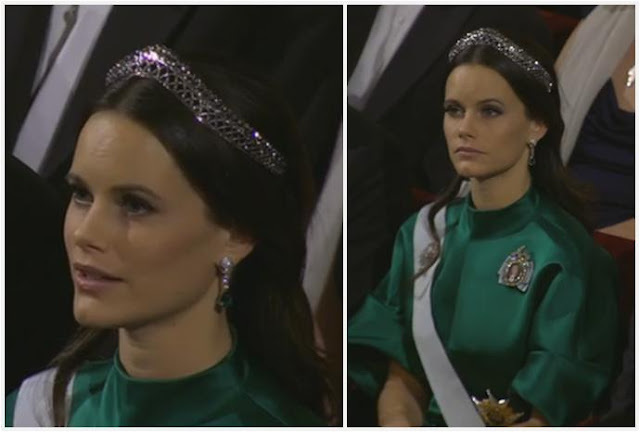 Princess Sofia is the second person to wear the tiara. Not only does the shape of the bandeau seem to suit Sofia, by wearing the tiara for an occasion that can be seen on video, she brought the Cut Steel Bandeau to life for me - and, I think, for many of you. Has this tiara won you over yet?